Many tribal communities live in the hill state of Uttarakhand, India. Jad is one of them. In official records as well as in much popular discourse they are simply called Bhotiya. The Bhotiyas are one of the major sub groups of the Central Himalayan region. Historically, the community belongs to the Nilang and Jadong valley and used to live at the bank of Jad Ganga in Uttrakhand near the border of Tibet. After the war of India and China in 1962, they had shifted to Bagori and Dunda villages near Harsil in Uttarkashi district. It is interesting to note that they live in Bagori only in summer season that is from May to September and migrate in winter season to Dunda near Uttarkashi town from September to April. A few of them also go to a place called Chorpani near Rishikesh in winter season to protect their goats and sheep from snow and to find to find food for them. Here they also trade their woolen goods with locals. In winter season only few people stay back in Bagori village to guard their houses. The census of India does not count them separately because their total population is less than 10 thousand. According to Breton, as mentioned in the Ethnologue in 1977 there population was 300. Mr. Bhawan Singh Rana, who is Sarpanch (Pradhan) of Bagori village, informed us that there are around 1000 voters in his village and the population of the community is around 2000 in 350 families. The name of their language is also known as Jad/JaaR which belongs to the Tibeto-Burman language family. 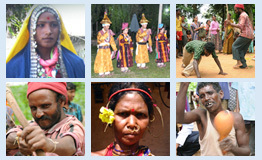 JaaR, Jadh, Rongpa, Rongma, Rongba, Bhotia is alternated names used for the tribe as well as the language. In UNESCO’s report ninety seven Indian languages are considered as endangered and Jad (ISO code-jda) is one of them. Presently the language is influenced by the other dominating languages of the area. It does not have script and people who were well versed in its oral literature have died. They have lost the songs that were sung at weddings and other special occasions. At home though the older people speak Jad language among themselves without mixing but the younger generation uses a highly mixed variety. During conversation the effect of Garhwali and Hindi can be heard easily among the young generation. The Jads were followers of Tibetan Buddhism but Hindu influence can be seen easily and now they practice rituals of both the religions. The Jads celebrate the Buddhist New Year Losar and hang prayer flags on the top of their houses and at the same time they profess faith in many Hindu deities and rituals, and insist that they are ethnically distinct from Tibetans. Every year in the month of April, Ringali Devi of Dunda is worshipped. After this ritual, the Jads start moving towards their summer habitation at Bagori. In ancient time Buddhist Lamas were employed to conduct religious ceremonies and medical treatment. But now they have started celebrating various Hindu as well as Buddhists festivals. Jad people marry within their own community and with the Jad people of Chamoli, Garhwal and Himanchal. The community is divided into two groups, one of them considers itself more enlightened and higher and they do not marry in the other group. Though all of them are scheduled tribe but it was noticed that the higher group members call the other group as scheduled tribes. At the time of death Jad people call the Buddhist priest (male /female), who decides the time and day for the funeral. On the basis of the Buddhist Calendar (Panchang) funeral can fall after two to three days so till then they keep the dead body at home only. On the third day of the death all the village children are invited to eat food and on the seventh day every villager is invited to eat food. After that the ashes of that dead is thrown in the river Ganga. The main source of livelihood for the Jads is animal husbandry. Earlier they used to raise Yak but presently a few families have Yak. Presently most of them rear sheep and goats and procure wool from sheep. Jad women are very proficient in knitting. One can see them regularly involved in knitting. Other occupations include agriculture and allied activities like- trade, business, unskilled and semi-skilled labor and government service. In Bagori some people have Apple orchards also. The preparation of trilingual Jad -English-Hindi dictionary, Grammar and ethno- linguistic report is in progress.